Crater Rock Museum houses the finest displays of rocks, minerals and gems on the West Coast. Exhibits include a collection of world-class minerals, collection of petrified woods, fossils, Native American artifacts, and much more! The museum gift shop is filled with the works of local artists from the Roxy Ann Gem & Mineral Society. The museum started out as a humble “shack” where locals could visit and perhaps ask about an interesting rock, or to gather around as a group and share “rock hounding” stories. It’s grown a lot since then. In fact, we’ve recently completed our expansion project that began in 2003. The original 5,400 square foot museum is now more than 12,000 square feet, housing community meeting rooms, a larger gift shop, workshop, and exhibit areas. Guided tours are available by appointment. We also offer meeting facilities to house one-time gatherings, or on-going weekly or monthly business sessions. The operation and development of the Crater Rock Museum has been entrusted to the Roxy Ann Gem and Mineral Society. RAGMS is organized as a non-profit corporation: Roxy Ann Gem and Mineral, Inc.
Children 5 years old and under, Roxy Ann Gem & Mineral Society and Museum members – FREE! 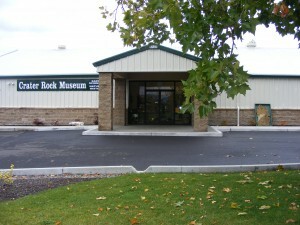 The mission of Roxy Ann Gem and Mineral, Inc. dba Crater Rock Museum is to educate and enlighten people of all ages through the study of earth sciences, geology, lapidary, mineralogy, natural history, and paleontology by conducting tours, teaching classes, and maintaining museum displays.